Response envelope: Milkweed A2 size (4-3/8x5-3/4) Envelope lining inserts of orange sugarcane (assembly required). Completely Sold Out! We cannot get the orange sugarcane paper any longer, nor the Cosmo flowers. Sorry! We love you, Cosmo. Gloriously Electric Wedding Invitation for a Contemporary Garden or Outdoor Wedding. 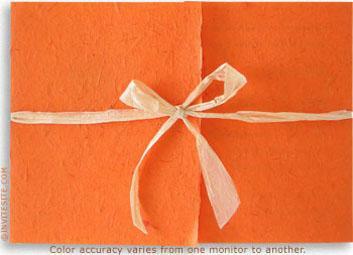 DIY Very Orange Invitation with pressed cosmo flower- tree free& post-consumer recycled papers. Organic landscape invitation wrapped in a orange sugarcane and mulberry paper wrapper with one deckled edge. Invitation is printed on soft white mulberry card, mounted on recycled cardstock for extra weight. You mount an exuberant (real) pressed orange cosmo flower on the invitation. RSVP enclosures and map neatly tuck inside. Closes with a natural paper raffia tie. Envelope: Milkweed 100% post consumer 70 lb. A7 envelope (very handsome) with orange mulberry envelope liner (assembly required). Colors: Orange. Complex soft white (ivory overtones) papers and envelopes. Wrapper:Natural medium weight sugarcane and mulberry with one deckled edge. Scored.